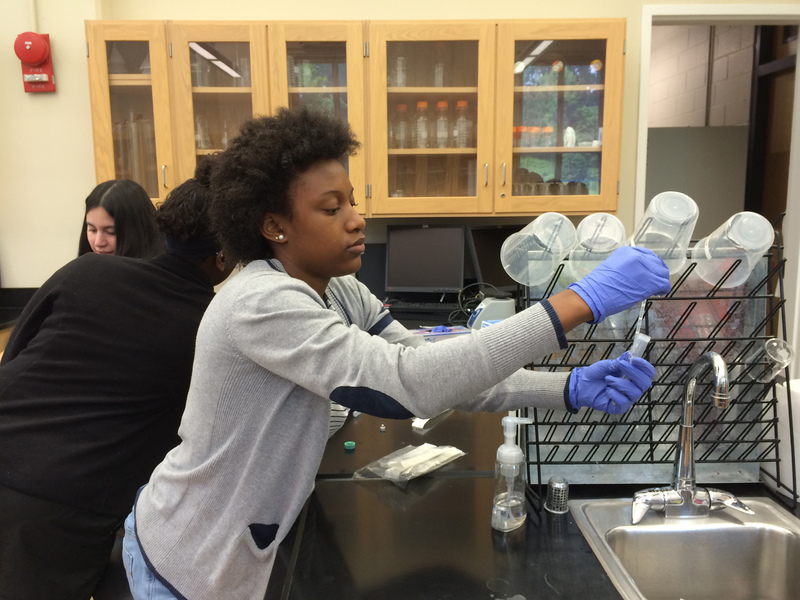 Students from Osbourn Park High School learn about DNA extraction. 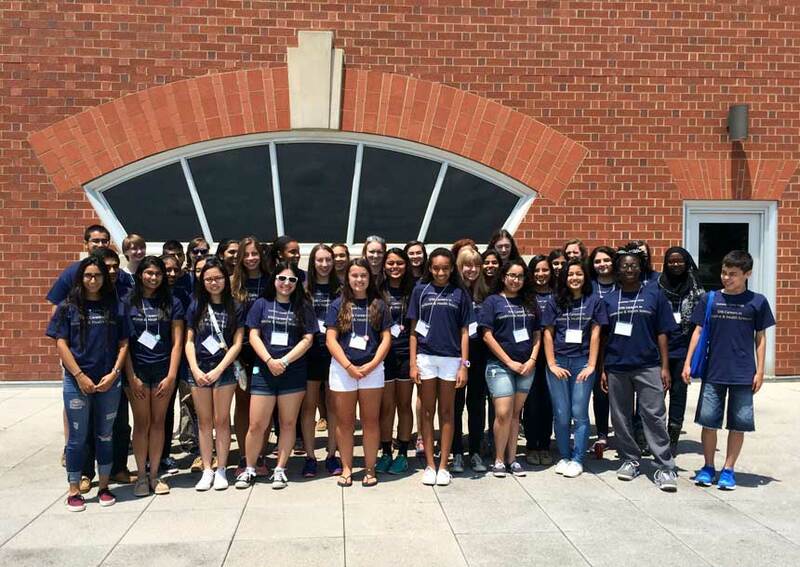 Forty students from Osbourn Park High School’s Biotechnology Center in Prince William County, Va., are one step closer to “figuring out what they want do with their lives” thanks to a career exploration camp at the GW Virginia Science & Technology Campus. 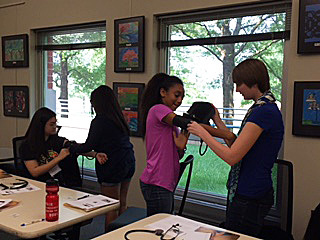 GW’s School of Medicine & Health Sciences (SMHS) partnered with Prince William County Public Schools and Northern Virginia Community College’s SySTEMic Solutions, to offer the inaugural four-day summer camp exposing these highly motivated students, already focused on studying health sciences, to learn more about their career options. The camp, held from June 29-July 2, allowed students to gain in-depth knowledge of various medical and health care professions. During the first three days of the camp the students started with a college preparation session and then alternated between two career sessions. Know Yourself: Students participated in a self-assessment exercise to identify their personality traits, interests and skills. The self-knowledge gained from the exercise helped them in selecting their college major and exploring different career options. How to Choose the Best Fit College: Students learned to consider a wide variety of factors when choosing a college, such as location, climate, class sizes, majors and cost. Transferable Skills: Students learned resume writing techniques and discussed how to gain experience to include on their resumes. Clinical Research Administration: Students learned about the field of clinical research administration and how a new drug goes from research and development to market. Medical Laboratory Sciences: Students viewed different diseases under microscopes and learned about different laboratory techniques to identify them. Nursing: Students toured the School of Nursing’s Skills and Simulation Laboratory, a sophisticated learning environment and interacted with many of simulated (manikin) patients. 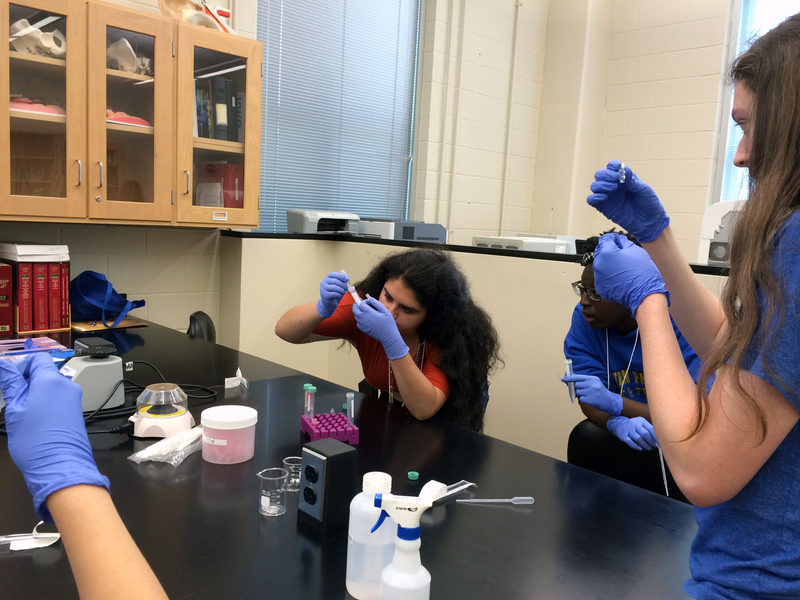 Pharmaceutical Sciences: Students learned about isolating DNA through a DNA extraction lab and discussed its use in forensic science and medicine. Physical Therapy: Faculty shared an overview of the physical therapy profession with students. For their interactive activity they took each other’s blood pressure, which is a skill used in the profession. Physician Assistant: Students were provided with an overview of the physician assistant profession, followed by an interactive activity learning how to tie surgical knots. The students were exposed to two more career areas from special lunchtime presentations, with Jehan El-Bayoumi, speaking about her experiences as a physician and professor of medicine and Karen Schlumpf, instructor of clinical research and leadership, talking about the field of epidemiology. On the last day of camp the students learned more about career pathways and participated in an in-depth bioethics case study with Shawneequa Callier, assistant professor of clinical research and leadership in SMHS. She gave an overview of the different ethical theories, followed by presentation of a case study on an Ebola outbreak. Students formed a mock committee of medical providers tasked with treating the patients and had a heated discussion about who should be treated first. One of the participants wrote, "I really enjoyed this program and getting the opportunity to explore different paths. It helped me to think about what I want to major in." Participating students from Osbourne Park High School. 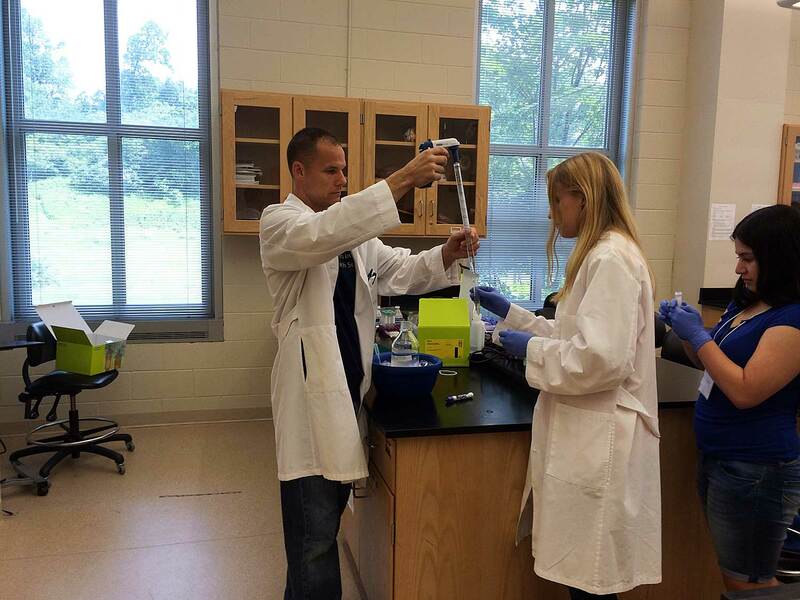 Pharmaceutical Sciences Career Session: Students learned about isolating DNA through a DNA extraction lab and discussed its use in forensic science and medicine. 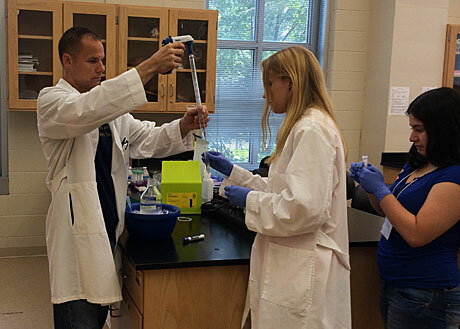 Professor Travis O'Brien teaches the Pharmaceutical Sciences Career Session, where students learned about isolating DNA through a DNA extraction lab and discussed its use in forensic science and medicine. 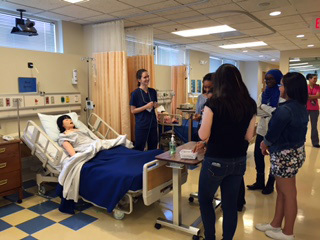 Nursing Career Session: Students toured the School of Nursing’s Skills and Simulation Laboratory, a sophisticated learning environment and interacted with many of the simulated (manikin) patients. Physical Therapy Career Session: Faculty shared an overview of the physical therapy profession with students. 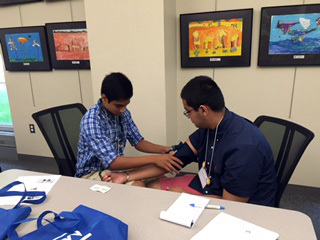 For their interactive activity they took each other’s blood pressure, which is a skill used in the profession. 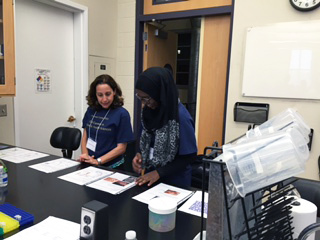 Professor Marcia Firmani explains to a student about the field of medical laboratory sciences in the new wet lab in Discovery Hall. 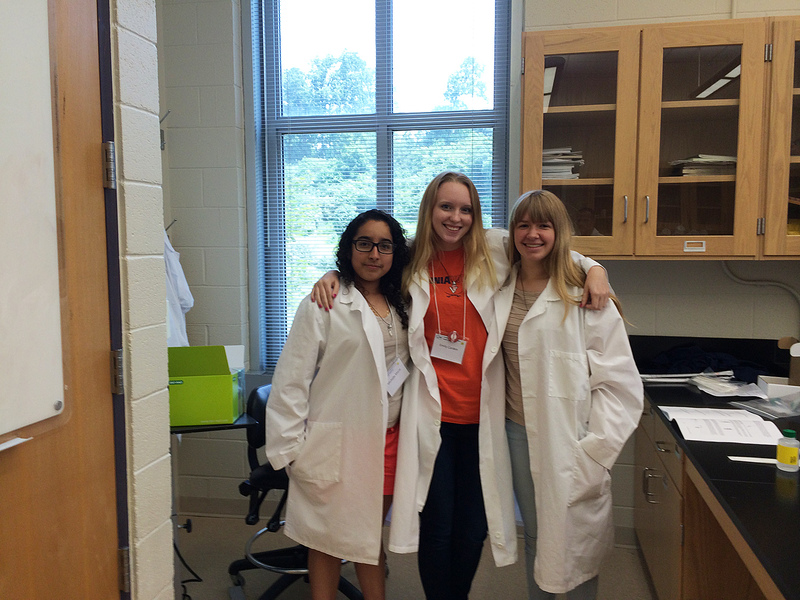 Students participated in an in-depth bioethics case study of an Ebola outbreak.